Would anyone be interested in swapping spare chilli plants? I've got a few, hopefully there will be more by time germinating has finished. 1 plant for 1 plant , 2 for 2, 3 for 3 you get the idea. I'll cover cost posting to you if you will do the same. Scarlet, Chris11, Ms-T and 3 others like this. I don't have anything I could safely package them in, I don't think. Also I HAVEN'T GOT ROOM FOR ANY MORE VARIETIES - when will I get this simple idea into my thick skull? I have to confess to having thrown out several surplus germinated seedlings already - I feel like a murderer. Last edited by Mitzi; 25-01-2018 at 12:22 PM. Small pumpkin, Norfolkgrey, Dalrimple and 2 others like this. Small pumpkin, Norfolkgrey and Aunty Social like this. You could package them in toilet roll inners plus some bubble wrap. Scarlet, Small pumpkin, Jungle Jane and 3 others like this. Now that's a good idea. OK, I'm in! Some of my spare seedlings are looking rather lanky at the moment, though, as they haven't had any daylight. Small pumpkin, Chris11 and Aunty Social like this. I'm very easily pleased I'd be happy with anything as long as I'm not growing it already and it's not pretty in purple . I'd even consider varieties I grew last year but have dropped . The way my germination is going I'd probably be over the moon if you had a lemon drop available! Scarlet and Aunty Social like this. A plastic takeaway meal box is good too. Wrap the seedlings in cling film and pack them closely in the box. Pad with bubblewrap, put the lid on and stick in an envelope. Scarlet, Ananke, Small pumpkin and 5 others like this. I'm very easily pleased ,I'd be happy with anything as long as I'm not growing it already and it's not pretty in purple . I'd even consider varieties I grew last year but have dropped . 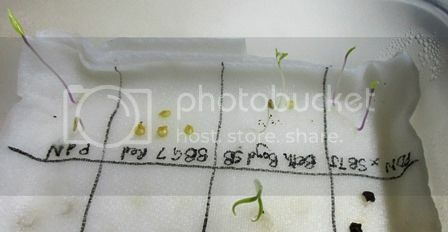 The way my germination is going I'd probably be over the moon if you had a lemon drop available!